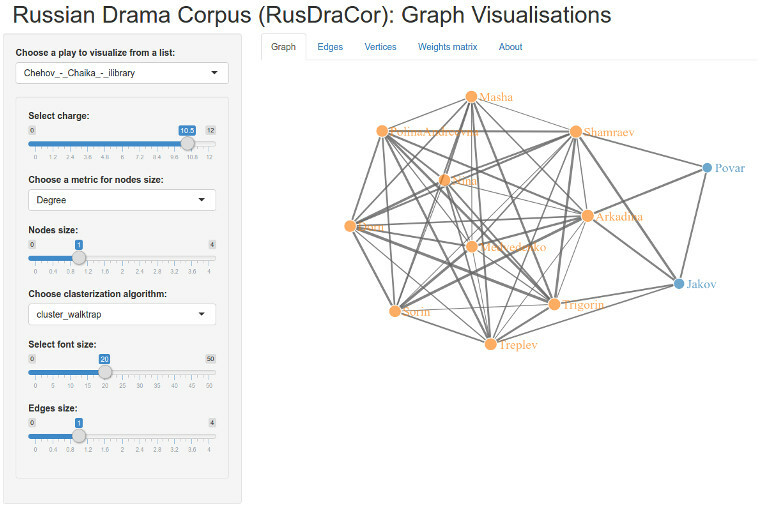 A couple of days ago, we presented a first version of our TEI-encoded Russian Drama Corpus (RusDraCor) at the CORPORA 2017 conference in St. Petersburg (slides). Our goal is to assemble hundreds of Russian plays from the 1740s (Sumarokov) up to the 1930s with authors like Gorky and Mayakovsky. Right in the middle, chronologically, our corpus features a number of plays by Gogol, one of which is “Театральный разъезд после представления новой комедии” (“Leaving the Theatre after the Presentation of a New Comedy”; full text at ilibrary.ru). This is a ridicilously big social network for a theatre play (99 characters, it is hard to find plays with more characters). The reason is that Gogol’s “Leaving the Theatre” is a metaplay. Gogol started to draft it right after his infamous “Revizor” was released in 1836, but he didn’t publish “Leaving the Theatre” until 1842. Like mentioned above, we can distinguish 99 characters (or voices) in this play. Most of the people are just pouring out of the theatre, alone or in groups of two or three, contributing their bit, then vaporising into the evening. We cannot really apply our understanding of social interaction here (the ‘digital spectator’), but with a little tweak we can create a meaningful graph. The play has no acts or scenes, so we segmented it to catch what Manfred Pfister called ‘configurations’, subsets of the character list of a play, i.e., groups of people present on the stage at a certain point during the play. For all characters present in the same segment, we would establish a relation. That way, we’d end up with many small, unconnected subnets. And here comes our tweak: Since our “author” character eavesdrop on all conversations, we added him to all 37 ‘configurations’, ending up with the star-like network you’ve seen above. Of course, this is an experimental extension of our approach, but it still helps to better understand the structure of Gogol’s metaplay. For example, we can easily tell apart single characters uttering their opinion and larger conversations involving a group of people, something that doesn’t become as clear when close-reading the play. Btw, the underlying CSV file for “Leaving the Theatre” can be found here. Our current algorithms aren’t able to extract an abstract entity like “laughter” as part of a communication network, but who knows, involving more actor–network theory might bring us a whole bunch of new ideas. … and can be accessed at https://rusdracor.shinyapps.io/showcase/. 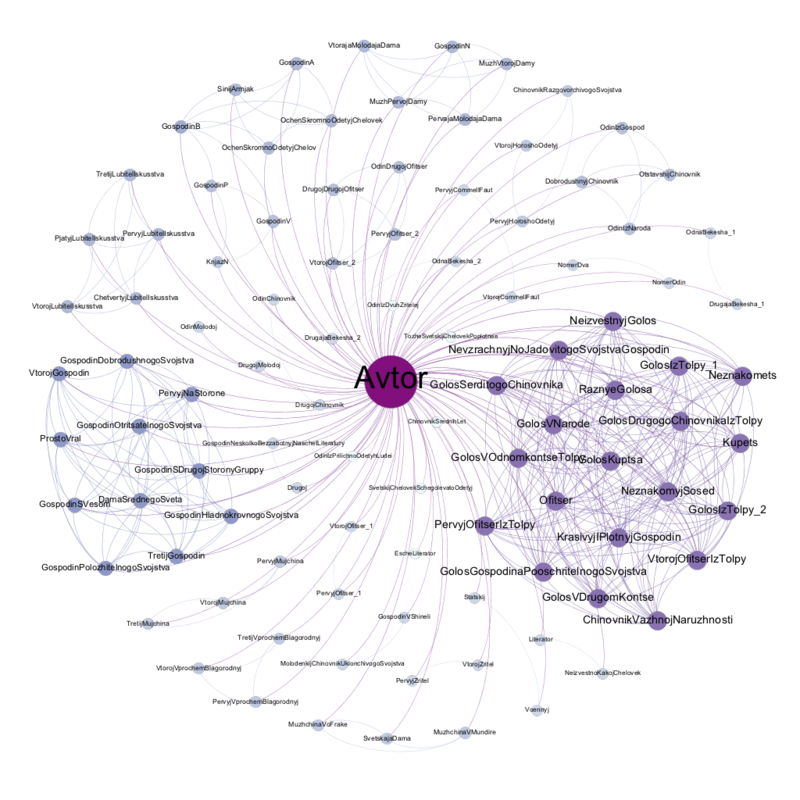 It features live data, so to speak, continuously generated from our TEI files as the corpus grows. “Leaving the Theatre” is among the plays, as are works by Blok, Bulgakov, Chechov, Fonvizin, Gorky, Gumilyov, Krylov, Mayakovsky, Ostrovsky, Plavilschikov, Prutkov ☺, Pushkin, Sumarokov, Leo Tolstoy and Turgenev. And more is to come. Oh, our project will also be presented at the “Digitizing the Stage” conference starting tomorrow at the University of Oxford. If you have further questions leave a comment or send an email to German. You should not miss his outstanding website. If you have further questions leave a comment or send an email to Ivan. You should not miss his outstanding website.